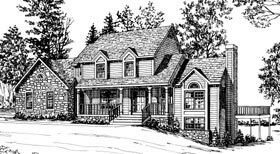 This hillside house with stone and cedar siding and large front porch creates a warm and relaxing atmosphere for your family's enjoyment. Views provided in the Great room to the front, rear and side yard enhance the indoor outdoor relationship; while the informal lifestyle offered here leads to the frequent use of the expansive decking. An extra large kitchen and breakfast area accommodates the casual dining experience while the spacious formal dining room provides for special occasions. Located in the rear of the home are the split stairs leading to the three bedrooms on the second floor. The extravagant master bedroom suite includes a double vanity, whirlpool tub, shower and a large walk-in closet.